Algonquin Round Table: a website created by historian Kevin C. Fitzpatrick devoted to the history, members, and writings of The Vicious Circle. When Robert Benchley, the drama critic for The New Yorker, went on vacation in 1931, Dorothy Parker filled in and published a series of theater reviews loaded with her lacerating barbs. Playing the reluctant critic, she ended each of her articles with variations of a “personal” plea to Benchley (“Please come home. A joke’s a joke”). One of the performances Parker reviewed was of The Barretts of Wimpole Street, a British import that had become a Broadway hit. “If you want to,” Parker wrote, “you can pick me out of any crowd, these days. 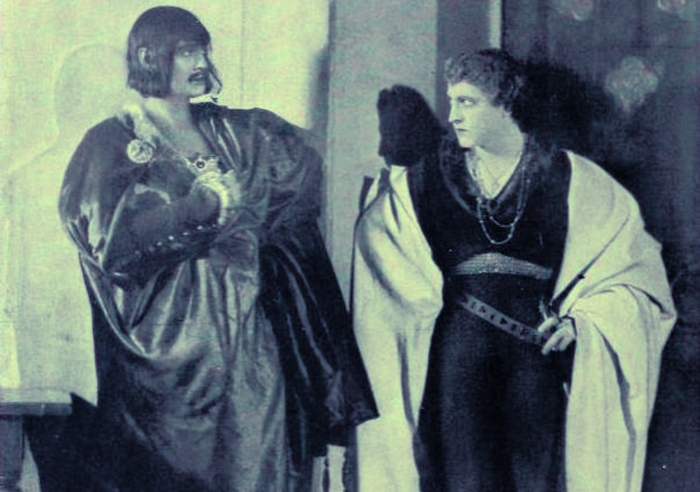 I am the one in the corner who did not think that The Barretts of Wimpole Street was a great play, nor even a good play.” She found many things about the show to admire, although she was back-handed even in her acclaim for the star Katharine Cornell (“a completely lovely Elizabeth Barrett—far more lovely than the original, I fear”), for the production (“nothing but praise; I cannot remember seeing better direction that night”), and for the costume designer (“enchanting; I do not believe there is half enough screaming about Mr. Mielziner”). “Personal: Robert Benchley, please come home. Nothing is forgiven,” she added. It was precisely this take-no-prisoners approach to drama criticism that got her fired from Vanity Fair a decade earlier. In 1918, as the war ended, the magazine’s drama critic, P. G. Wodehouse, returned to Europe and twenty-five-year-old Parker stepped into the role. Her only previous experience before joining Vanity Fair had been writing captions and performing miscellaneous editorial tasks for several years at Vogue, another Condé Nast publication. In her new job, she met Benchley and Robert Sherwood, and the three employees would often have lunch at the Algonquin, forming the kernel of the group of writers, critics, and actors who would later become famous as the Algonquin Round Table, or The Vicious Circle. Broadway producers, a major source of advertising for the magazine, were soon fed up with Parker’s bon mots. The final straw was a sniping review of W. Somerset Maugham’s play, Caesar's Wife, produced by Florenz Ziegfeld and starring his wife Billie Burke. According to historian ‎Kevin C. Fitzpatrick, Burke in particular “set Parker’s teeth on edge, primarily because she was 35 and still playing ingénue roles.” Parker’s one-paragraph notice warned theatergoers not to expect another droll Maugham comedy. “The evening seems a long and uneventful one,” she sighed, before directing her aim at the lead actress. “Burke, in her role of the young wife, looks charmingly youthful. . . . In her desire to convey the girlishness of the character, she plays her lighter scenes as if she were giving an impersonation of Eva Tanguay,” the famed and flamboyant Queen of Vaudeville. After getting an earful from Ziegfeld, Vanity Fair editor Frank Crowninshield capitulated to his advertisers and fired Parker. Benchley and Sherwood quit in protest. In the late 1920s all three would end up reunited at The New Yorker, where—except when Benchley took a vacation—Parker was confined to the less volatile terrains of writing poetry and reviewing books. Not all of Parker’s pieces while at Vanity Fair were pans, and we reprint below one of her more favorable assessments. Still, “even Parker’s praise, as in this review of a costume melodrama featuring those scions of an acting dynasty, the Barrymores, was tinged with acid,” notes Laurence Senelick, editor of the LOA anthology The American Stage. And Parker still couldn’t resist opening her review with a broad dismissal of virtually every other show on Broadway. Notes: The playwright Edward Sheldon had a string of Broadway hits, including Romance (1913) and The Song of Songs (1914), many of which were made into movies. The pianist Josef Hofmann first became famous as a child prodigy; frequently photographed, he was regarded by audiences (although not by all critics) as one of the world’s greatest pianists. Elmer Oliphant played fullback for the football teams at Purdue University and the U.S. Military Academy, becoming one of the top scorers in college football history. During World War I, to help fund the war effort, the Treasury issued 25-cent Thrift Stamps; when purchasers had acquired sixteen Thrift Stamps, they could exchange them for the interest-bearing War Savings Certificates. For this week’s selection, we depart from the usual format and reproduce the selection, in its entirety, below. The Pollyanna system has recently been worked out with particularly brilliant effect, in the theatre. When the latest attractions at the local playhouses were so consistently poisonous that one had just about decided to give up the whole thing and stay at home in the evenings to see if there was anything in family life—then along came Mr. Arthur Hopkins and he produced “The Jest.” And, once again, all’s well with the world. It is difficult to write of “The Jest,” for enough has been written about the thing to fill the Public Library comfortably, by this time. Everyone knows that it was written ten years ago by Sem Benelli—then in his late twenties—who was known in these parts heretofore only for his libretto of “L’Amore dei Tre Rei”; that in Italy, where its name is “La Cena Delle Beffe,” it is practically a national institution; that Bernhardt played John Barrymore’s part in French and another woman, Mimi Aguglia, played it in Italian; and that the pre­sent production at the Plymouth Theatre is the first English version of the play. The name of the translator is no longer withheld; everyone knows that Edward Sheldon did the deed. Whether or not he has translated it into verse is still the subject of hot debates among the cultured. The ayes seem to have it, so far. If the English version is in what, in our youth, we used to speak of affectionately as dear old iambic pentameter, the actors mercifully abstain from reciting it that way; they speak their lines as good, hardy prose. The Sunday supplements have printed long excerpts from the text, illustrated with scenes from the play and with weirdly blurred portraits of the author—portraits which look strangely like composite photographs of Harry Houdini and Josef Hofmann. The name Benelli has rapidly become a household word; little children in Greenwich Village chant it at their play, mothers hum it about the house; fathers whisper it through the smoke of their cigars. It is a good name for household pronunciation, too; you can’t get into any arguments about it, the way you did about Ibanez. It is even more difficult to write about the production and the acting of “The Jest”—superlatives are tiresome reading. The highest praise is the attitude of the audience, every evening. They say—they’ve been saying it for years—that it is impossible to hold an audience after eleven o’clock. The final curtain falls on “The Jest” at a quarter to twelve; until that time not a coat is struggled into, not a hat is groped for, not a suburbanite wedges himself out of his mid-row seat and rushes out into the night, to catch the 11:26. One wonders, by the way, how the commuters manage; they must just bring along a tube of toothpaste and a clean collar, and make a night of it. Anyway, there is not so much as a rustle before the curtain drops. Every member of the audience is still in his seat, clamoring for more at the end of the last act. There can be no greater tribute. Once again the Barrymore brothers have shown what they can do when they try. They have easily outclassed all comers in this season’s histrionic marathon—they have even broken their own records in “Redemption” and “The Copperhead.” Their rôles—John plays Giannetto, the sensitive young artist, and Lionel, Neri, the great, swashbuckling mercenary—afford a brilliantly effective study in contrasts. The part of Giannetto, exquisitely portrayed no less by gesture and pose than by voice, is in its morbid ecstasies, its impotent strivings, its subtle shadings, undoubtedly far more difficult than the blustering rôle of Neri. Yet the physical strain of Lionel Barrymore’s per­for­mance must in itself be enormous. How his voice can bear up all evening under Neri’s hoarse roars of rage and reverberating bellows of geniality is one of the great wonders of the age. Not an extraordinarily big man in reality, he seems tremendous as he swaggers about the stage; in his fight scene, he goes through a mass formation of supernumeraries much as Elmer Oliphant used to go through the Navy line. And in some strange way, he manages to make the character almost likable. Again, one must pre­sent it to the Barrymores; they are, indubitably, quelque family. It is a bit rough on the other actors in “The Jest,” for the Barrymores’ acting makes one forget all about the other people concerned. It is all the more credit to Gilda Varesi that she can make her brief characterization stand out so vigorously. Maude Hanaford and E. J. Ballantine also contribute effective per­for­mances. But the Big Four of the occasion are unquestionably the Barrymore brothers, Arthur Hopkins, and Robert Edmond Jones. Scenically, the production of “The Jest” reaches the high water mark of the season—which isn’t putting it nearly strongly enough, unfortunately. Mr. Jones has devised a series of settings which are the most remarkable of his career; the year holds no more impressive picture than that of Giannetto’s entrance, as he stands, cloaked in gleaming white, against a deep blue background, the dark figure of his hunchback servitor crouching at his side. The whole production is a succession of unforgettable pictures. That, indeed, is just the quarrel that some people have with it. Those who have seen “La Cena Delle Beffe” on its home field say that the American production is a bit over-spectacular —that the production cuts in on the drama. The attention of the audience, they say, is diverted from the action by the amazing picturesqueness of the scenes. Well, their view is high over the heads of the untraveled. To one who has seen only this production, any better seems impossible. The simple, homely advice of one who has never been outside of these broadly advertised United States is only this: park the children somewhere, catch the first city-bound train, and go to the Plymouth Theatre, if you have to trade in the baby’s Thrift Stamps to buy the tickets. The play will undoubtedly run from now on. You ought to be able to get nice, comfortable standing-rooms, any time after Labor Day. Originally published in the June 1919 issue of Vanity Fair. Brilliant. Thanks for sharing. There is a typo in the image caption of "The Jest" It should read "February 1920"